I have / soon to bin about 5 Drobo’s. Sick of the product and their so called receptionist style support staff. I cant understand in this day technology is so competitive that they survive. It seems for every one or two Drobo success stories there is a plethora of customer experiences which directly questions the Drobo ecosystem of simplicity, customers and satisfaction. 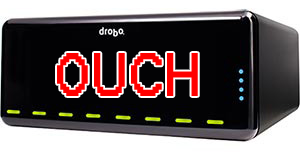 I wish I could post the email trail in regard to Drobo support and management interaction. They simply have no idea and the amazement quickly learns toward being dumbfounded and sense of hopelessness. I made contact with a recovery organisation based in Russia of all places and the data is no longer being held captive or a Drobo refugee. I understand Drobo is not a backup solution and technology fails BUT Drobo is a twist of dominoes and Russian roulette (excuse the pun). Drobo just don’t seem to get it. When you start off embarking on capturing a market you have nothing other than a promise that your offering is great and customers will come according to word of mouth, reviews and media campaigns. After some time your product takes place to your brand. Well Drobo seems to forget, without customers their brand means nothing. I am now the proud owner of an 8 bay Synology. Why did I wait sooooo long. I must be a technology sadist.